Dr John Bradshaw is a biologist at the University of Bristol in England. 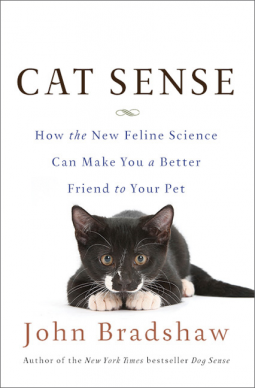 He has studied animal behavior for thirty years, and he recently released a book called Cat Sense, subtitled "How the new feline science can make you a better friend to your pet." The general idea is that dogs were domesticated by humans for a specific purpose, while cats domesticated themselves. They were good at catching mice and moved into a win-win partnership with humans; we harvested grains which attracted mice. Humans enjoyed cats getting rid of the pests, and cats enjoyed an abundance of food. This means that cats have stayed pretty much the same during the ages. In addition to the wild history, Dr Bradshaw thinks 85% of all cat matings in the US are arranged by cats themselves. (That is, they involve a feral cat.) If this is correct we can't expect kitties to grow any more domesticated any time soon. For better and for worse. The author also suggests that cats regard their owners as mother-substitutes. We are in effect large, hairless, non-hostile cats. Cat Sense is available as e-book, hardcover, or audio book. If you're interested in the book, the New York Times has published a review. Cats have been popular household pets for thousands of years, and their numbers only continue to rise. Today there are three cats for every dog on the planet, and yet cats remain more mysterious, even to their most adoring owners. Unlike dogs, cats evolved as solitary hunters, and, while many have learned to live alongside humans and even feel affection for us, they still don’t quite "get us" the way dogs do, and perhaps they never will. But cats have rich emotional lives that we need to respect and understand if they are to thrive in our company.